This enhancement is a remarkable media which enables users to achieve writing the following correspondence in ELLIOTT: dunning letters, prospect follow-up letters (contact management), customer evaluation letters for returned merchandise and sales, thank you letters, event notification and invitation, and labels, etc. The most advantageous feature of this enhancement over word processors in the market is the availability of ELLIOTT’s Customer database. By using this enhancement, users can avoid lengthy procedures for preparing many types of correspondence. And also users can enjoy the easy use of this enhancement by forgetting about generating a customer list and learning complicated mail merge theory in any word processor. 1. Letter Code: This field allows alphanumeric data entry with eight spaces. 2. Description: This field is the Letter Code Description that lets the user enter alphanumeric data entry up to 30 characters. 3. 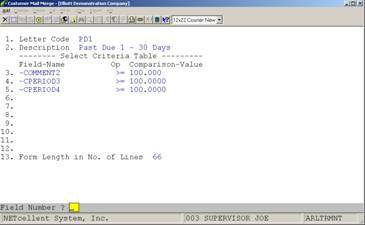 Criteria Table: This enhancement allows the user to enter up to 10 conditions, which will restrict the number of output. The relation among these 10 possible conditions is AND by default. Fundamentally, the user needs to construct a comparison statement for each condition. The statement consists of three components: Field Name, Operator and Comparison-Value. Each of these elements will be discussed in the next three paragraphs. The user can take a look at the screen below to get an idea of what the Criteria Table is all about. In this screen, four conditions have been set up in the Criteria Table, which restricts the dunning letters to be printed for customers who have outstanding balances past due at least 30 days-- greater than and equal to $100.00 for 30-60 days, less than $100.00 for 60-90 days, and less than $100.00 for more than 90 days, and also the customers who have been designated to receive a dunning letter if a payment is past due. TIPS: Before constructing a Criteria Table, we suggest the user work on a scratch paper for all the conditions first. This way will help the user verify if the conditions set up in the Criteria Table logically make sense. Another issue we would like to remind the user of is that if he/she creates two codes at the same time for the same purpose (for example, dunning letter), the conditions in the Criteria Table have to be mutually exclusive. This is the operand left to the operator. The user can utilize all the fields in the Customer file plus some special fields added to this enhancement. The special fields will be described in the next paragraph. 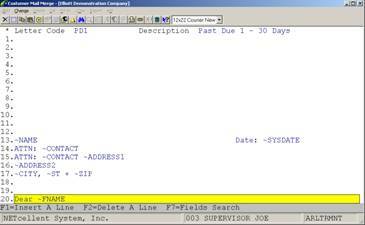 A Fields Name Search window is available to the user as indicated in the screen display. The key to access the search window, as usual, is F7. An important piece of information that the user is required to pay attention to is if he/she would like to use Customer Aged Amt in distinct periods as operands, he/she must execute Age Customer Accounts under A/R Processing in order to get an accurate aged amount in each period. 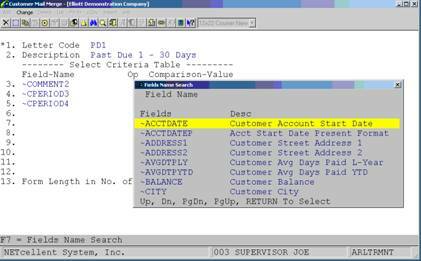 A Fields Name Search window can be accessed by pressing the F7 key in the Field-Name field. This is the first word in the Customer Contact field. The user has to implement a way of entering the Contact person’s name, which is first name and then last name in order to print the first name right. This is usually used for salutations. This field is typically used to print letters for prospects that were contacted a certain number of days ago. It indicates how many days have passed since the first contact with a particular prospect. This field can be used to print letters for those who have not made a payment for a certain amount of time. It indicates how many days between the System Date and the Last Payment Date have passed. This field can be used to contact customers who have not made any purchases for quite a long time. There can be customers that made purchases before, but have stopped the vendor-buyer relationship for various reasons. The user can re-pick up these customers by writing a promotion letter to encourage them to come back. This field indicates how many days between the System Date and the Last Sales Date have passed. 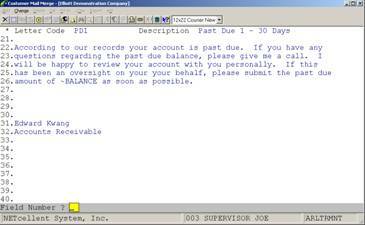 The user may sometimes may put a date in the Customer Note Date field for special purposes. ~SY-NOTE indicates how many days between the System Date and the Note Date has passed. ELLIOTT will use the date from the computer’s internal clock if this field is selected. This is a typical field for the user to indicate what date this letter is printed. ELLIOTT will use the time from the computer’s internal clock if this field is selected. This is a typical field for the user to indicate what time this letter is printed. The Comparison-Value can be either numeric or alphanumeric data, depending on the data type of corresponding compared Field-Name. For example, Customer Balance Amt in Period 2, ~CPERIOD2, is a numeric field, so the Comparison-Value is structured as a numeric operand, 100 in this case. The Form Length refers to the size of the printing material. The data entered here should convert to the number of lines beforehand. For instance, if the label length is three inches, the number of lines will be 18, for six lines can be printed in each inch zone. We specified 66 lines will be printed, which eventually implies 11” paper will be used for printing. The screen following the Letter Header screen is a working area where the user constructs the letter. The body screen consists of 60 lines where the user can put the letter content, including sending and returned addresses, salutations, and the main body of the letter. The operation is very straightforward-- PICK ‘N DROP. Step 1: Pick a field by utilizing the field search window. Step 2: Drop the selected field in any place of the working area. For the field name operands, when the system prints the letter, it will grab the data associating with each field name rather than what the user types in the body. A sample letter is attached at the end of this documentation. The user may refer to the sample to get this enhancement’s implementation idea. The following screens show examples that the user can PICK ‘N DROP. The user can easily distinguish a field from a literal because a field name begins with tilde (“~”) rather than an alphabet. First screen of the letter body. The user can put the fields in any place of the screen. Note that blank lines from 1 to 10 are left for the letterhead. In line 17, a “+” sign is followed ~ST. The user may refer to the SPECIAL SYMBOLS section. The second screen of the letter body. The user can put the fields as part of the letter content as well, such as variable ~BALANCE in line 14. When the system prints the letter, the actual amount of balance will show in the letter instead of the literal, ~BALANCE. The user does not have to worry about where to put a “:” in the salutations area due to the fact that the length of customer names varies. A “:” will be printed immediately following a field name variable if the user types ~Field Name:. For instance, Isabelle’s salutations will be printed as “Dear Isabelle:” according to line 20 in our illustration Figure 38.3. The user does not have to worry about where to put a “,” for the City due to the fact that the length of customer city names varies. A “,” will be printed immediately following a field name variable if the user types ~Field Name:. For instance, city name Checamonga will be printed as “Checamonga,” according to “~CITY,” entry in line 17 of our illustration in Figure 38.3. This sign is used for concatenation purposes between two fields. For example, if users would like to print both customer Address1 and Address2 in the same line, they should enter “~Address1+ ~Address2”. Other symbols, such as “.”, “%”, “!”, “(“, “)”, “/”, “\”, “?”, “;”, “<“, “>“, “=“, “*”, also have a concatenation effect when they immediately follow field name operands. The only difference between the Plus Sign and other special symbols is that the Plus Sign will not be printed, but others will be, including Comma and Colon. Attention: All signs listed above should be used immediately after the field name operands. The user should not use any other special symbols following the field name operands, or the system will not be able to recognize field names. This section lists some scenario examples. If users fully understand all these examples, they can challenge themselves by setting up more complicated conditions to achieve the goal of generating different types of letters. 1. Send dunning letters to those who have a more serious outstanding balance with at least $5,000 past due in period 3 and less than $1,000 in period 4, and have been assigned to receive notice by dunning letters. Send dunning letters to those who have a total past due amount in periods 2, 3 and 4 exceeding $10,000.00. 3. Send a follow-up letter to PRPCT type of customer that we have contacted falling in a range between 30 and 60 days since the first contact. 4. Send a follow-up letter to DEALR types of customers that have made a purchase exceeding $1,000.00 last year and have not purchased for at least 90 days since the last sales date. The ability to print customer Labels based upon selection criteria is another advantage to this program. 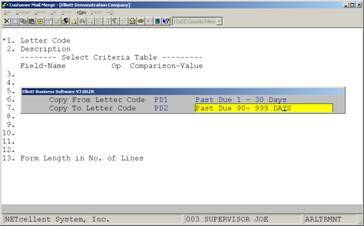 To setup label format, the user has to enter the number of lines for a Form Length. Each inch can accommodate six lines. Therefore, if the user has three-inch labels, he/she will have to enter 18 for the Form Length in No. of Lines field in the Letter Header screen. The above screen shows where to put the fields to print labels. To print letters with mail merge, the user can utilize the Prt_ltr option located on the menu bar. Following the selection, the system will pop up the printing window, asking for the type of letter identified by the Letter Code, as well as the Customer No. It is similar to any of Elliott’s printing windows. The screen display illustrates the printing screen of letters. The main goal that Copy function is trying to achieve is saving the user’s time to re-create a letter that has a similar format and criteria. The user can employ this function to copy one Letter Code to another. The screen display shows the Copy function window. 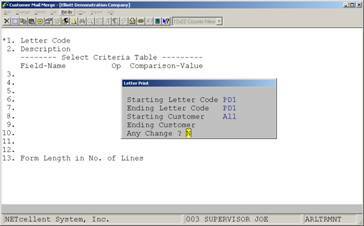 Once the user specifies the source and destination for letter codes, the setup in the Letter Header and the content in the Letter Body will be duplicated in the new Letter Code. The Letter Code Copy function requires the user to enter source (from) and destination (to) letter codes. 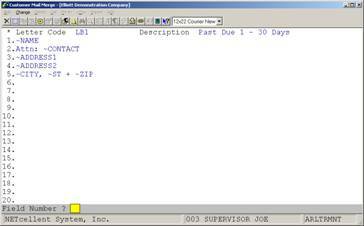 Upon specifying the Copy-To Letter Code, the system will move the cursor to the description field for entry.